And you think I would forget this wonderful once a year celebration to honor our fathers? Nope, I might be late but will never ever in my mind to skip this day without telling the whole world how lucky I am to have a wonderful Father. Words are not enough to describe the overwhelmed feelings I do have for my father, because without his guidance, teachings and discipline I would never be into where and what I am right now. I do admit that you may not appreciate what your father or parents do for you when you were a little it's because you don't really know the WORLD YET. And now, that I mature enough to understand everything they did, I am SUPER LUCKY for that. So to my beloved Father and Brother who is celebrating and honor their FATHERHOOD. HAPPY FATHER'S DAY. LOVE YOU BOTH AND THANK YO SO MUCH FOR EVERYTHING. I may not be physically around but in my heart you are both close with me. have a great day novah! hugs! 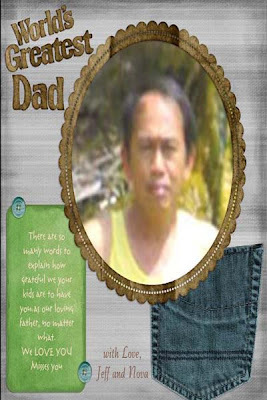 This is very sweet of you to have written a post for your dad and all dads.. its very true, we tend to disregard our fathers when we are kids.. but the realization does come in later which gives us a proud feeling to be their daughters and sons. how sweet of u sis to write this. btw, i have a tag for u sis,if ur not so busy i hope u take it. ty! 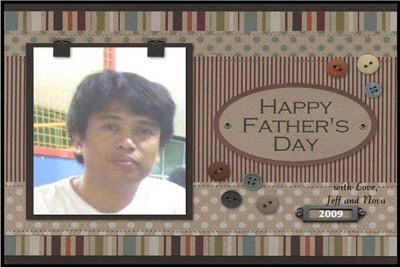 happy father's day to ur dad and bro!